Purple marijuana strains are beautiful to look at and inhale. In our first of this two-part series on purple marijuana strains, we noted that purpling comes from a combination of environmental factors and/or plant genetics. Purple colors on a cannabis plant can indicate nutrients, lighting, or grow op environment problems. Read here for more information on that. Many growers use feeding procedures that boost marijuana floral development, resin glands, and weight in purple and non-purple cannabis. During bloom phase, some purple marijuana growers use P-K boosters, amino acids, potassium silicate, cannabinoid boosters (such as Bud Factor X), Bud Candy, and a high-powered hydroponics base nutrients formula such as Connoisseur to get deeper coloration, stronger taste and aroma, heavier harvests, and more potency. The taste of grape or berry is often reported for purple marijuana strains. Grand Daddy Purp: Known by several names, and with origins and phenotypes that people heatedly argue about, this most-famous purple cannabis strain is referred to as GDP, Granddaddy Purps, Grand Daddy Purp, Grand Daddy Purple, etc. A California cannabis breeder, entrepreneur and activist named Ken Estes is said to have created “the real” Grand Daddy Purp. To recognize a true GDP, look for buds that turn purple around weeks 5-6 of bloom phase, to the point where you’re seeing almost no green at all by harvest time. Another characteristic of an authentic Grand Daddy Purp is that properly-grown buds are dense nugs of resin glands with almost no hairs or extra leaf material. This strain, like most purple strains, is a heavy feeder…so feel free to experiment with pushing your parts per million (ppm) until you start to get the tiniest amount of leaf tip burn, then do a mini-flush and back off the ferts by about 50-100 ppm to avoid overfertilization. Your authentic Grand Daddy Purp marijuana strain will finish during weeks 7-9 of bloom phase, giving you long colas of kind purple bud. Another fine purp from TGA Seeds. TGA Subcool Seeds purple marijuana strains: You see us talk a lot on BigBudsMag.com about TGA Subcool marijuana seeds. That’s because Subcool and other professional cannabis breeders associated with TGA are the most friendly, reliable, and helpful of all the major North American seed companies. In fact, Subcool recently told us his seeds are so popular that he’a having a hard time keeping up with demand. Unlike other seed breeders, he pollinates in small batches and has rigorous quality control. He won’t release a pack of seeds unless he’s sure every seed contains the genetics and freshness he guarantees. You know a cannabis seed breeder is super-popular when he tells a marijuana magazine that he doesn’t need more publicity! Purple Apollo 13, also known as The Void: Subcool says this is a heavy-yielding purple marijuana strain, as long as you give it a longer than average grow phase so it sets up the plant structure it needs for heavier yields. It’s mildly Sativa dominant (60-40) and provides a stimulating high. Look for about 8 weeks in bloom for this purple beauty. Deep Purple is a backcross of the famous Urkle, Sub says…a cross of Purple Urkle with Querkle. It tastes like grape snow cones, and is almost all Indica (10/90 ratio). Be advised that some phenotypes of this strain don’t go purple, and you can harvest after 49-61 days in bloom. 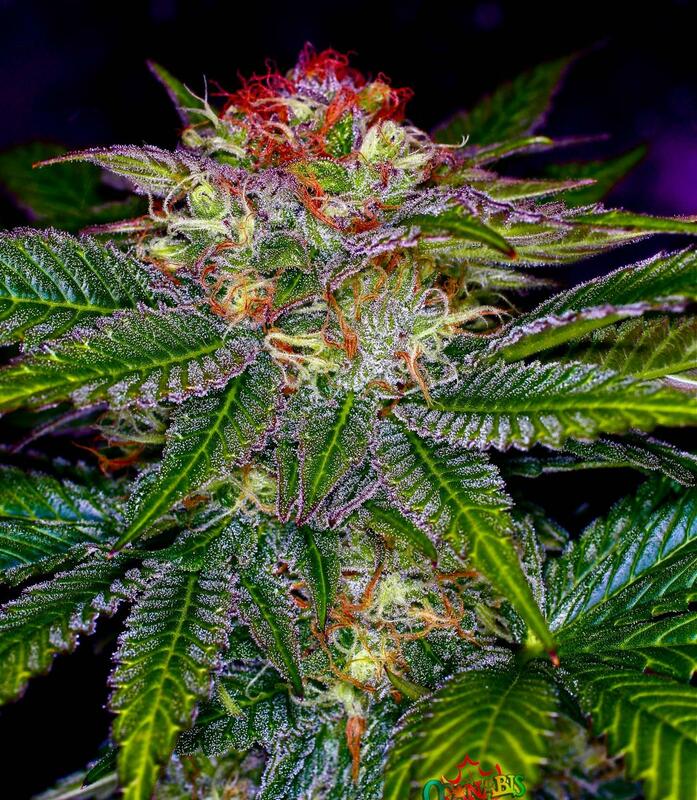 Subcool Seeds Querkle cannabis strain is an Indica-dominant hybrid that almost always shows purple, with luscious grape flavors and a hint of Sativa high even though its dominant genetics are Indica. You get medium to heavy yields of dense grape-colored buds from this purple marijuana strain, with an average 8 weeks bloom phase. Blueberry, by DJ Short: There are several Blueberry imitators, but the original was created by legendary cannabis breeder DJ Short, and that’s the one you want to grow. Some would argue this is not a “true” purple marijuana strain, because although the buds turn red and purple, by harvest time they’re closer to a reddish-blue. On the other hand, Blueberry marijuana is highly valued because it smells and tastes like blueberries; it’s ready to harvest after a 6-8 week bloom phase; it yields heavy; it’s a short, dense strain ideal for smaller growing areas, and it has a powerhouse 80% Indica genetics high. When grown using Big Bud, Overdrive, and Bud Factor X, you get branch-bending yields and are advised to use plant supports so your branches don’t break! Original Flo, from Dutch Passion: This is one of the most beautiful and sought-after marijuana strains. Developed in 1998 with help from Blueberry marijuana legend DJ Short, Original Flo is nearly 50-50 Indica and Sativa. It has hints of Thai, Afghani, and Mexican cannabis genetics and will give you deep purple buds after 8-9 weeks in bloom phase. Try incremental marijuana harvesting, especially if you’re growing Flo marijuana outdoors. This means you start reaping the benefits of your crop by starting harvesting during early peak bloom, with buds growing bigger and re-generating after you’ve done your earlier partial harvests. Purple Wreck, by DNA Genetics: The Dutch cannabis seed company DNA crossed a California Urkel with a Train Wreck male to speed up Urkel’s slow-moving growth rate and increase the yield. Purple Jems, from Lowryder/Joint Doctor is a purple autoflowering cannabis strain that produces small but chunky purple nugs in as little as 8 weeks from start to finish. Blackberry Kush: Dense dark purple nugs, sometimes accented by orange hairs. This expensive, highly-desired purple marijuana has an Indica powerhouse high and a taste that mixes Diesel or jet fuel, with berries. As with Cherry Pie (see below), this is a clone-only strain. And speaking of clone-only strains, another purple powerhouse is Purple Kush. It’s a fast-growing, high-yielding, very popular purple marijuana strain that can be harvested as early as 51 days into bloom phase. It has an almost-exclusively body high, and that’s why it’s most often used as medical marijuana by people with chronic pain, seizure disorders, insomnia, and similar problems. This strain does well when you top it early and create a round bush with many flowering tops. It’s a heavy feeder, so load up on the Big Bud, Bud Ignitor, Overdrive, and other hydroponics bloom boosters we talked about earlier. Cherry Pie: This highly-valued clone-only strain is said to be a cross of Grand Daddy Purp and Durban Poison. Cherry Pie is a very hardy cannabis strain that grows easy, and likes extra fertilization in bloom phase. When you feed a booster such as Bud Candy to purple marijuana strains in bloom, you get a super blast of aroma and taste that makes your enjoyment better later on. Cherry Pie buds are super sticky and will go magenta, red, or purple late in bloom. It tastes and smells like cherries while it’s in bloom phase, and when you inhale it later. If it doesn’t smell like cherries, it’s not Cherry Pie. The only drawback to Cherry Pie marijuana is that it too is currently available only as a clone-only strain. If you want to grow a type of Cherry Pie from seed, go for Subcool Seeds Cherrygasm. Purple marijuana strains are some of the most favorite I’ve ever grown. You get the wonderful high and medical benefits of marijuana, you also get the stunning beauty of those richly-colored flowers. Enjoy your purple marijuana passion!